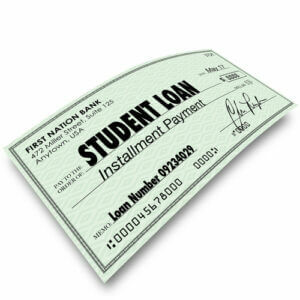 Student Loan installment payment check paying back money owed in obligation for borrowed funding for college or university education. Photo courtesy of Shutterstock. Student loan debt concept. Photo courtesy of Shutterstock. As an internship finder, you have the opportunity to gain work experience in a particular field that can benefit your job search. However, if you have bad credit it might affect your ability to land a job. Learn how to improve your credit in the following post so that it does not hinder your job search.